With KiwiSaver, scheme providers are restricted on what fees they can charge KiwiSaver members as the KiwiSaver Act requires that fees charged must be reasonable. With the Mercer KiwiSaver scheme being one of nine default KiwiSaver schemes, fees charged by the Scheme are the most scrutinised in New Zealand - so you can feel confident you are getting value for money. The Mercer KiwiSaver scheme charges two fees to administer and invest your savings. There are no charges such as entry or exit fees or investment option change fees. While we think fees are important and they have an impact on how much you will have at retirement, when considering KiwiSaver we think it is more important to ensure you are in the correct investment option for your life stage and circumstances, your tax rate is correct and you are contributing and receiving your member tax credits. As a member of the Mercer KiwiSaver scheme you will be charged two types of fees – an administration fee and a fund fee. Both fees are deducted from your investment and will reduce your returns. You also pay tax on fees at your Prescribed Investor Rate (PIR). These tax rates are – 28%, 17.5% and 10.5% and it is important you check the rate you are on and update it if necessary. It is a monthly fee which covers costs of day to day administration of your KiwiSaver account. You pay $2.50 per month and over the year it adds up to $30. The fund fees are charged as a percentage of your account value. Each of the seven available investment options is managed separately and there are different costs associated with managing each option. The type of asset classes that make up the investment option determine the amount charged. For example shares cost more to manage than cash or bonds. If you choose to invest in more than one investment option you will pay for each of these options, however each fee is calculated on the amount invested in that option and therefore will be proportionate to the total value of your investment. Based on the account balance of $14,000^ as at 31 March 2016, split evenly across the seven investment options, the total fund fees would have been $102.80 for the year. 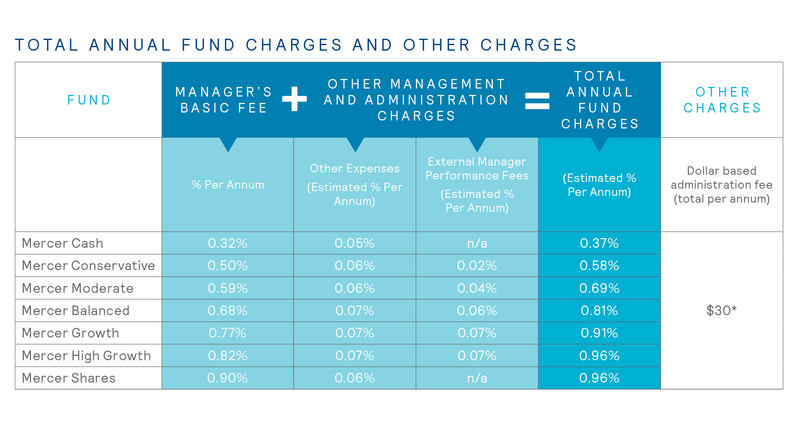 The below table shows an example of how the fund fees are calculated for each investment option and the total fund fee charged on the account. Based on the account balance of $14,000^ as at 31 March 2016, for example, in the Mercer Conservative investment option, the total fund fees were $79.80 for the year.